In today’s digital age, we are bombarded with more information than ever. Therefore, the power to influence has never been more important. 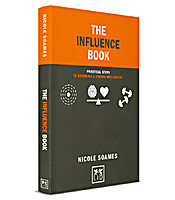 In The Influence Book, author Nicole Soames presents an engaging handbook that will teach you how to draw on your influencing skills, inspire others to make a change, create deeper relationships, improve performance, and build personal brands.